It looks like mother nature saved the best for last at the 5th and final event of the season for our middle school surfers. Awesome weather with sunny and warm days but the best was the 4 to 6 foot waves that offered up the opportunity for our surfers to show their talent and put on a show for everyone on the beach. Oak Crest locked up the season title for the Overall Team and their surfers solidified their place in the ratings. Unofficial until the top 4 events are posted but it looks like the following will be the Division Champs for the 2018-19 season: Luke Butterfield, Boys Shortboard; Syd Ott, Girls Shortboard; Casey Currie, Girls Longboard; Tyler Robles, Bodyboard. All of these champions are from Oak Crest Middle School. Jack Van Wagoner from Valley Middle School is the Boys Longboard Champ for the Season. Congratulations everyone on a great season. Thanks to Sharp Eye Surfboards for being on the beach with their demo boards for the kids to experience. Special thank you to Scott Graham and his Orange County Staff for coming up to help get our season finished while our San Diego Staff was at Ponto doing another makeup for our high school teams Division 3 & 4. Thank you to WSA for the use of their jerseys for the event. Thanks coaches, parents and teams for another great season. 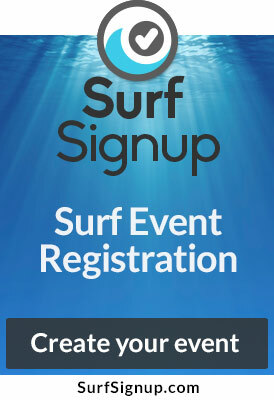 Get your entries in for State Champs which is April 27 & 28 at Oceanside South Jetty.